Bochums medics have succeeded in treating cerebral palsy after paediatric stroke with autologous cord blood. The baby girl, who was born seemingly normal and vital in 2004, presented a massive skull deformity with depression of the left temporal bone and upper left jaw. Magnet resonance imaging (MRI) of the maternal pelvis revealed an anomaly of the sacral bone, a so-called "long pelvis," which hampers the baby to negotiate the birth canal, as a cause for the skull deformity. 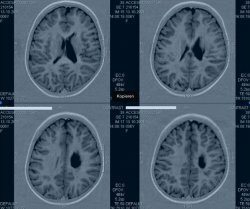 After six months, there were first neurologic anomalies on the right side of the body and after 10 months, right spastic hemiplegic cerebral palsy caused by occlusion of a small artery in the left brain hemisphere (ischaemic stroke) was diagnosed by MRI. After treatment with the cord blood containing stem cells at 5 years of age, the symptoms improved significantly. Over the following months and years, the girl recovered from hemiplegia to such an extent, that she is now able to participate in endurance city runs, obtained a lifeguard certificate in swimming, rides two wheel bicycle, and plays piano using her affected right hand. Our findings, along with those from newborns that suffered from lack of oxygen during birth, suggest that this new therapy is efficacious even years after the insult", Prof. Dr. Arne Jensen of the Campus Clinic Gynaecology said Monday. Together with his colleague Prof. Dr. Eckard Hamelmann of the Department of Paediatrics at the Catholic Hospital Bochum (University Clinic of the RUB), now Department of Paediatrics, Children's Centre Bethel, Bielefeld, he reports in the journal "Case Reports in Transplantation".